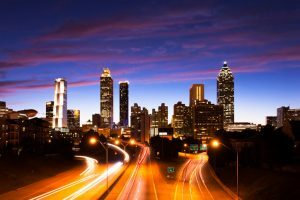 Last week’s fiery bridge collapse in Atlanta was top news all around the country, but the real story may end up being a new appreciation for—and much more use of—mass transit in and around the city. “It was nuts,” says Mark Vergenes, chair of the Lancaster (Pa.) Parking Authority and president of MIRUS Financial Partners. He was enjoying a steak dinner with a client in downtown Atlanta when everybody in the restaurant turned to watch the burning bridge on television. It didn’t take him long to realize getting back to his airport-area hotel was going to be a huge challenge. “Back roads were jammed,” he says. “They were stopping people on the road and turning them back the opposite way to get off the highway.” So he called Lance Lunsway, CAPP, senior director of parking and transportation services and new business development at Georgia Tech, for advice. Which was, “Take MARTA”— Atlanta’s commuter rail system. “Three dollars and an hour and 15 minutes later, I was at the airport,” Vergenes says. Atlanta schools are on spring break this week, which lightens the load on roads considerably. But many people have already started taking commuter trains and shuttles instead of driving to and from work and others have embraced carpools, so the number of cars on the road is significantly decreased from normal levels. Lunsway suspects people might continue taking mass transit even after the bridge is replaced (he guesses that might take six months to a year), now that they’ve tried it, so the collapse might be a catalyst for the growth of alternate mobility downtown. Kim Fernandez is IPI’s director of publications and editor of The Parking Professional.